Shammi Kapoor died this morning. If a soul survives the body, he will smile all the way to wherever he would go. If there is no such thing as a soul, his Yahoo… call will linger in our world for a long, long time to come. 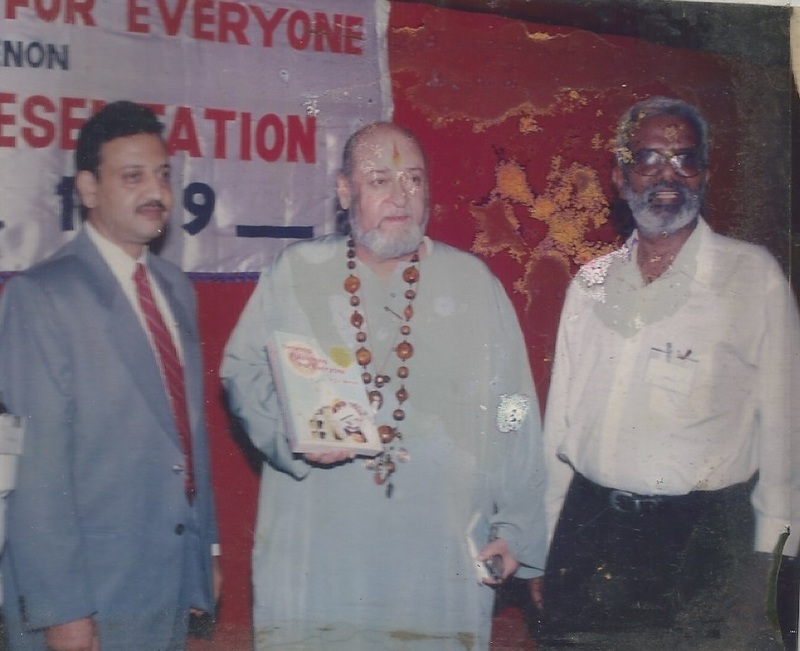 I had a personal agenda in wanting to meet Shammi Kapoor in March, 2000. The enthusiasm of Asha, my daughter, made up for my trepidation while we approached the watchman’s table outside his ground floor flat in Malabar Hill. “Sa’ab ghar mein Nai hein,” said the guard. He agreed to take a copy of my new book, Desktop For Everyone, and send it into his house. Three days later we called on him again. Who is it who wanted to see him, asked a voice over the Intercom. Asha, said my daughter. My heart sank. There wasn’t much enthusiasm in that voice. He greeted us at the door and shook hands. He wasn’t the Shammi Kapoor I knew in my youth. His hair was no longer the shiny black coiffeur-art that it once was. The portly gentleman in front was nonetheless as handsome as any 69-year old could hope to be. “You are lucky to have a daughter like her,” he said, tapping Asha’s shoulder. Indeed I was. But how did he know? Our visit was for selfish reasons. If I could even mention his name associated with the publication of my new book, I could expect much mileage. On the other hand, Shammi Kapoor had no reason to meet me. He was just a kindly man who took the trouble to read my book through – this was what he said – the major part of a whole night. “But why me?,” he said. “You should have met ……… He’s the computer expert,” he gave the name of an author of computer books I didn’t much care for. “You did much to popularize internet and digital computing in India,” I said. While I spoke of films, he showed us around his computer room. He had the latest Apple computer of the time and a printer and a router. He showed us the website he had designed for the Kapoor family. He told us how he came to buy his first computer in London just to get rid of transit boredom and fell in love with computing. I brought up the subject of Baburao Patel and how he once wrote, in reference to Kapoor family, that the Pathans would never learn to act. He didn’t promise to come to the launching of my book. “Let me see, I will try. You must also call someone else who is well-known. Your book deserves it”, he said. To me, that meant a polite no. I invited the director of Aptech to launch the book. On 24th April 2000, while Mr. Sharma, the director, was announcing the launch of the book, some in the audience stood up, others murmured. Shammi Kapoor, the famous actor, was walking down the aisle towards the podium. That did much more than making my day. He climbed up the dais with some difficulty on account of his weight, and spoke highly about my work. “I wish Menonji had written this book eleven years ago when I was struggling to get the hang of computers,” he said. I could have choked. He stayed back for the cocktail and dinner. He refused the scotch that was offered and asked for a soft drink. He was being considerate to an aspiring author, for I knew that the Kapoors of that generation were fond of Black Label. I wrote a short piece in Free Press Journal, mentioning his generosity, his handsome looks despite the age and receding hairline, his Rudraksh Mala with the image of his Guru in its locket and his not being too proud of his earlier style of acting. I sent a copy of it to him. He never mentioned it in his later mails – I wasn’t sure if it was because he was used to people writing about him to see themselves in print, or because he didn’t like the contents. I hope it was the former. We exchanged many e-mails since that glorious (for me) night. I requested him not to call me Menonji, but just Vishu, or if that sounded too familiar, Menon. “All right,” he mailed back. “I’ll call you Menon Sa’ab.” He stuck to the ‘Sa’ab part through all our later correspondence. Shammi Kapoor never failed to answer a mail. He even mentioned some of his own disappointments while consoling me about my departed son. Our correspondence trailed off due to my laziness, not his negligence. He replied my get-well message even when he was laid up in a Pune hospital. To me, Shammi Kapoor was a real hero – not just a filmi hero. Long live his name and fame. ‹ PreviousRICH COUNTRY, POOR COUNTRY- WHO’S GONNA SINK? And a proud experience for me. Thanks.